In my humble and spice obsessed opinion, Chinese chile oil is a must have for anything noodle related in China. 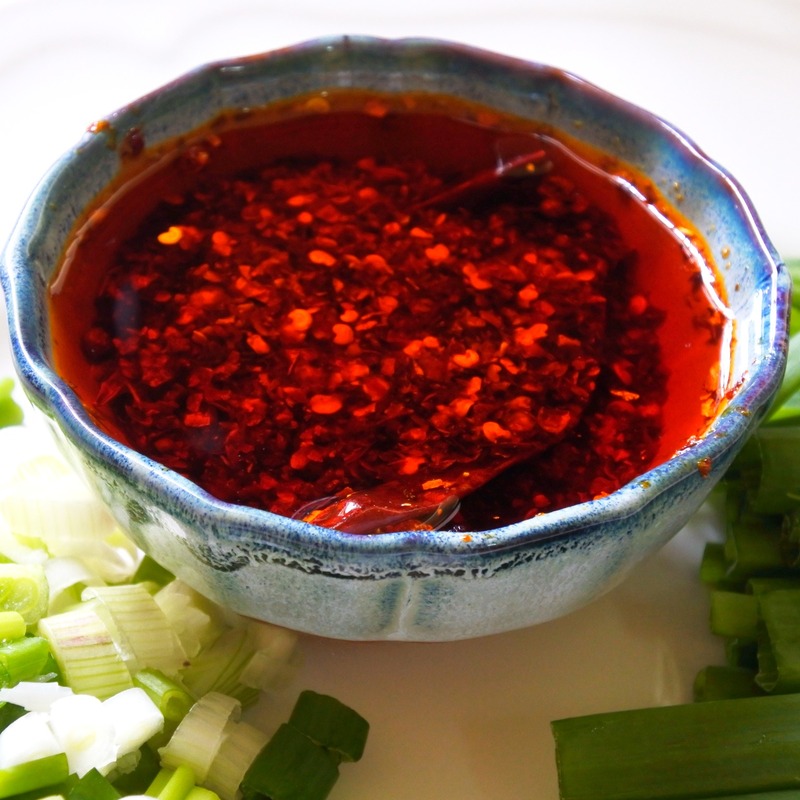 Mixed with black vinegar, it is a great dipping sauce for a big plate of steamed dumplings. A spoonful of it gives sesame noodles a little ‘something-something’ and no big beautiful bowl of NiuRou LaMian (Chinese Beef Noodle) would be appropriate without it. In fact, I always ask for an extra spoonful in my bowl much to the amazement of any onlookers. Although this oil is a ‘must have’ in our house, it was also something that I approached with a little trepidation. I knew this was an oil infused with red chili pepper flakes, dried chilies and Szechuan peppercorns but sometimes I would be surprised to find other things in it as well such as peanuts or gritty bone fragments. Don’t get me wrong, it was ALWAYS tasty but still that little bit of grit made me apprehensive of diving into it at full speed. To avoid any unwanted mystery ingredient, I now make my own at home. Even though it is loaded with various forms of chilies and peppercorns, this oil is more nutty than spicy. You can still feel the heat of the spice in the oil but it’s not as abrasive as some other hot sauces out there and is definitely worth a try. This is fairly easy to make so if you like it and are feeling creative, you can try adding in some additional ingredients to the mix such as peanuts, ginger, cloves or bone marrow to see if it changes up the flavor a bit. This chile oil is best when drizzled over noodle dishes but you can also try adding it to stir-fry or chicken wings or anything else you fancy. Add all spices and garlic to a container that is able to withstand high temperatures. In a dry pan, heat oil on medium high heat just until it begins to smoke. Turn off heat and add oil CAREFULLY to the container of spices and garlic. Let it bubble away until it is cool and all ingredients have infused into the oil. When ready, add a spoonful or two to your favorite dish and enjoy. Keep in a covered container at room temperature for no more than a month.